George and Harold aren't bad kids. They just like to 'liven things up' for everybody. Unfortunately, their thoughtful jokes sometimes get them into a lot of trouble. When Professor Pippy P. Poopypants becomes their new science teacher... well, George and Harold almost cause the entire planet to be taken over by a maniacal, mad-scientist guy in a giant robot suit! Who will stop the perilous plot of Professor Poopypants? This looks like a job for Captain Underpants! Now you can experience the book like never before! Download The Adventures of Captain Underpants app for your iPad from iTunes today! Yes. My wife, Sayuri (pronounced Sy-you-dee), and I got married in 2005. We spend most of our time in Washington, Ohio and Japan. I have two favourites: Super Diaper Baby 2: The Invasion of the Potty Snatchers and The Adventures of Ook and Gluk, Kung-Fu Cavemen from the Future. George and Harold started out as characters in your Captain Underpants books. Why did you decide to make them 'authors'? in 2002. The first book was The Adventures of Super Diaper Baby, which was a huge hit with kids. I love the fun and challenge of 'ghostwriting' for George and Harold because they see things a little differently than I do. Often I’ll have to abandon an idea or a joke because I know that George and Harold wouldn’t have liked it or thought it was funny. It’s OK though, because it forces me to think of better ideas and better jokes. What do you prefer: illustrating/painting or writing? Illustrating is definitely easier than writing, but I think I prefer writing because it takes less time. Is it hard being your own boss? Incredibly smart children with excellent taste. What was your favourite book or author as a child or teenager? When I was a kid, my favorite books were: A Fish Out of Water by Helen Palmer and P. D. Eastman (illustrator), Where the Wild Things Are by Maurice Sendak, and Georgie and the Robbers by Robert Bright. Those were the books I remember reading over and over and I would often grab a stack of paper and try to draw the characters. The book that influenced me the most as a child was The Children in the Jungle by Leif Krantz and Ulf Lofgren (illustrator). It’s been out of print for a long time, but this book had a direct influence on many of my books, from When Cats Dream to The Adventures of Ook and Gluk, Kung-Fu Cavemen from the Future. There’s even a three-word sentence from The Children in the Jungle that I have used in every Captain Underpants epic novel. As an adult, I fell in love with the books of James Marshall (George and Martha) and Arnold Lobel (Frog and Toad). I owe so much to the influence of these two wonderful artists and their gentle humor. Did you have a role model as a kid? Not really, unless you count the Six Million Dollar Man. I really don’t read many books these days. The last really great books I read were the Frannie K. Stein books by Jim Benton. Who is your favourite author and/or illustrator now? What is your favorite thing to do as an author? Phthalocyanine Blue. I can’t pronounce it, but I like it. I think most of the stories are inspired by memories from my childhood — by the feelings of helplessness and frustration I felt (and I’m sure most kids feel) when I was constantly surrounded by adults who were either mean, dumb or unfair (and sometimes all three). 'Kid empowerment' is a very strong theme in my books. Which character(s) from your books are the most similar to you? George and Harold are both based on me when I was in elementary school. Like George and Harold, I was always getting in trouble with one authority figure or another when I was a kid. My troubles usually came from trying to entertain the classroom (with either my comics or my silly behavior). But unlike George and Harold, I don’t think I actually saved the world very often (maybe just once or twice). Do you think you prefer working with a deadline or is it better to go at your own pace? Right now I work best with deadlines. I was always one of those students who wasted tons of time, then 'crammed' for my tests at the very last minute. I do my books pretty much the same way (although I’m trying to change that). Did you ever do well in school? I did OK in school. I could have done much better if I’d really applied myself, but where’s the fun in that? When you were little, did you get along with your sister, Cindy? Yes. We got along twice. Do you get along with her now? We get along much better now because we have more in common with each other. First and foremost, we’re both crazy about her three kids. Do you spend time with her and her family? Yes! In fact, we all made a movie together. It’s a very silly thirty-five minute comedy/action/musical/monster movie called F.A.R.T.S. The Major Motion Picture. It will be part of an upcoming book called F.A.R.T.S. The Major Motion Picture. Why do your books usually include potty humor? I think potty humor is an essential part of any good book. Questions about Super Diaper Baby 2: The Invasion of the Potty Snatchers. 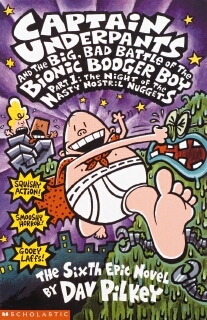 Recently you stopped writing Captain Underpants novels and began making full-length graphic novels by George and Harold. Why? While I LOVE Captain Underpants and his many friends and enemies, I sometimes want to write about new and different things. The Tree House Comix books (starting with The Adventures of Super Diaper Baby) give me a chance to tell new and different stories, while still keeping these adventures “grounded” in the Captain Underpants universe. Don’t worry, though ... Captain Underpants will be back. My next two books will be about him. Why do you write from the perspective of George and Harold? Well, George and Harold are both based on me as a kid, so I’m really just trying to write from the perspective of myself — as akid. Did you make spelling mistakes on purpose or are you just really bad at spelling? What do you say to adults who complain about the bad spelling? Actually, I rarely get complaints like that. Most parents and teachers write to express their gratitude because these books were the first books their children ever read — or wanted to read. If somebody does complain about the spelling, I point out (as politely as possible) that these 'mistakes' occur in my books for a reason: I’m secretly trying to inspire kids to write, and to create their own stories and comics. creating their own stories 'just for fun'. time they ever realised that writing could be fun. And who knows? That very thought could inspire a lifetime of creativity! What was the inspiration for the villain, Rip Van Tinkle? He is actually based on a superhero I created when I was a kid. His name was 'Water Man' and he was made completely out of water. Rip Van Tinkle is a lot like Water Man, except that he’s a bad guy and he’s made out of pee-pee. They both have the same powers and abilities, though. How many Super Diaper Baby books will there be? I only have three planned, but I’m sure I’ll think of more some day. The reading level is 'officially' ages 7 to 10, but I’d like to think the interest level would be more like ages 4 to 140. Is it easier to draw as George and Harold (since their drawing style is more primitive than your style)? because I accidentally drew it 'too good'. Do you think the book will be a big hit? Yes, I think this new book is even funnier than the original Super Diaper Baby. Just write. Get it out on paper and don’t worry about being perfect or profound. That stuff can come later when you edit. How long does it take to do each page? About four to five hours of work goes into each page, although most of that work is never seen (I spend months on the writing, sketches, and various drafts, which only a handful of people see). Questions about The Adventures of Ook and Gluk, Kung-Fu Cavemen from the Future. How did you come up with the story of Ook and Gluk? during his presentation, it must have occurred to him that his toy wasn’t very impressive. So he tried to spice things up by telling the class that his toy was actually a prehistoric ambulance that cavemen used to drive when they took sick dinosaurs to the hospital. The funny thing was that none of the other children were sure if he was telling the truth or not (after all, they were only five years old). I liked the little boy’s tall tale so much, I drew a sketch of two cavemen paramedics and named them Ook and Gluk. I carried that sketch around with me for two or three years as I developed the plot and the characters. I still have it, actually. For more details, check out the video 'Ook and Gluk: Behind the Blackbelts' on my website. Do you think your new book The Adventures of Ook and Gluk, Kung-Fu Cavemen from the Future will be as popular as your world famous Captain Underpants books? everybody’s asking when the next Ook and Gluk book will be coming out. Which character do you think you are most like in Ook and Gluk? Where did you come up with the names for the story? I didn’t really put too much thought into their names. They were just the first cool sounding names I came up with. Are you happy with the way the book came out? If not, what would you change? Do you think Ook and Gluk would rather live in the past, present or future? Would you rather live in the past, present or future? I’m pretty happy in the present. Are there going to be more Ook and Gluk books? Yes. I have at least two more books planned (but there will probably be more than that). Did you invent Cavemonics when you were a little kid or when you wrote the book? I came up with the idea when I wrote the book. I was just planning to call it 'How To Talk Like Caveman', but my wife thought up the name 'Cavemonics', which is WAY funnier! Where did you get the idea for Captain Underpants? I mean, what inspired you to write about Captain Underpants? my life making silly books! Why did you decide to make Captain Underpants into a children’s book? After my first silly book came out in 1988, I did a lot of author visits at schools. These were basically forty-minute presentations where I would show slides and draw huge pictures on a giant tablet of paper. During these presentations, I told children about my childhood and how I invented Captain Underpants as a second grader. As I told this story, I would draw a giant picture of Captain Underpants, in all his 'underpantsy' glory and the room would EXPLODE with laughter and excitement. Again, the room would explode with cheering and clapping — even standing ovations sometimes. I think it was then that I first realised that Captain Underpants might be popular with kids. They had to be funny. They had to have either robots or monsters in them (preferably both). They had to have TONS of illustrations (I made sure there was at least one on every page). They had to have short chapters (many of them are only one or two pages long). They had to be at least 100 pages long so they would qualify for book reports. Has anyone ever asked you if they could make a live-action Captain Underpants movie? Yes, I’ve had some attractive offers in the past, but the timing has never been right. Who do you think would make a good Captain Underpants? Hmmm... Maybe Jack Black or Zach Galifianakis. They would also make very good Mr. Krupps, too! Why did you decide to put comics and Flip-O-Ramas in Captain Underpants? It just kind of happened naturally. When I originally came up with the idea for Captain Underpants, I just made drawings and comics about him. Since he was a superhero, comics seemed like the best way to bring him to life. Also in elementary school, my friends and I constantly made 'Flip-O-Ramas' (we called them 'Flip-Actions' back then). We even made them in high school. When I started working on the Captain Underpants series as an adult, I based the characters of George and Harold on myself, so it was only natural that they would make their own comic books and their action scenes would be portrayed with Flip-O-Rama pages. How did you get Scholastic to publish Captain Underpants? I only had to convince one person: my editor, Bonnie Verburg. Bonnie is both my editor and also the publisher and founder of The Blue Sky Press, an imprint of Scholastic Inc). So one day back in 1995 or 1996, Bonnie and I sat at a table in the cafe of the Art Institute of Chicago, and I pitched Captain Underpants to her. I told her the story, showed her some sample comics I had made, and then I pulled out a sketchbook that included a hastily penciled story called 'Furious George'. Furious George was designed to showcase the wonders of Flip-O-Rama. Each page of text was followed by a ridiculously violent 'flip-action' scene of a gorilla beating the tar out of someone. Bonnie flipped through the story, smiled and said, 'OK. I’ll publish it'. 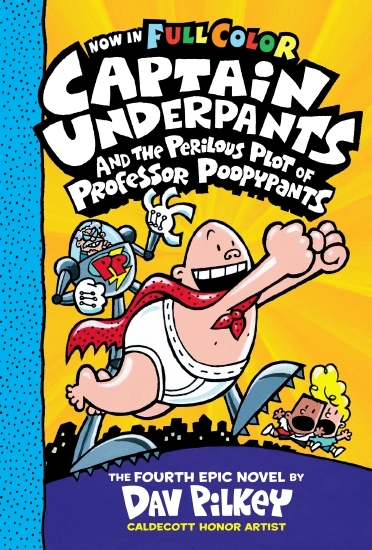 How did you come up with the idea for Professor Poopypants’s Name Change-O-Chart 2000? chances for sweet revenge were sometimes diminished. The Name-Change-O-Chart 2000 was my way of 'evening the playing field'. With this chart, EVERYBODY’S name could be changed into something ridiculous. No longer would the John Smiths and Billy Joneses of the world have anything over on the David Pilkeys or the Jimmy Fadbutzes.